Sushi lovers and their sushis, it remains a mystery to me the allure of raw salmons and sushis to these wonderful people. I'm not generalizing, lots of people love sushis and with the recent bloom in sushi restaurants everywhere, we are all spoilt for choice. 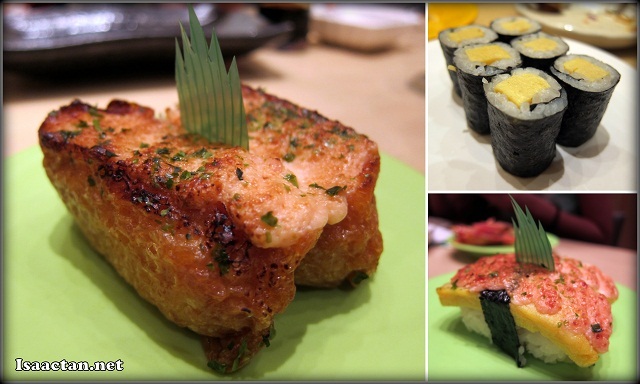 Recently I had the chance to go for a round of good sushi at Sushi Tei in Tropicana City Mall. With a concept similar to Sushi King, but with a better presentation and atmosphere, I couldn't wait to dig in. Sushi Tei is currently having their Spring Promotion, with dishes which we had the chance to sample. Service was quick, and the dishes came out pretty quick from the waitress there. Sushi Tei originated from Singapore with various other outlets nationwide employing an open concept kitchen where patrons could see their meals being prepared. Check out below on what we had that wonderful afternoon. All the dishes had these Japanese words attached to it, and even though I used to study Basic Japanese back in my university days, it was all still alien to me. The Kamaage Shirasu, Chutoro & Negitoro Don consists of steamed baby sardin, tuna belly & minced tuna belly on sushi rice. How's that for a nice tuna combination? I liked the fact the baby sardin was soft and mixed well with the rice. Up next was the Sakura Okonomiyaki which was basically egg omelette with colourful and tasty toppings. The Eringi Batayaki however was rather unique, eringi mushroom with Japanese leek, it's not often I've tasted this type of dish. It was a tad too oily though, but had lots of mushroom flavour to it. It was sashimi galore next as we were served with 2 sashimi dishes back to back, namely the Sashimi Moriawase "Wakana" and the Chu Toro Sashimi. Perfect for the sashimi and raw fish lovers, but not so perfect for me as I am not really into sashimi and all. Any fresh sashimi is good sashimi to me. My favourite dishes at any Japanese themed restaurants would definately be their soft shell crabs. I just can't get enough of these savory tasty crabs. 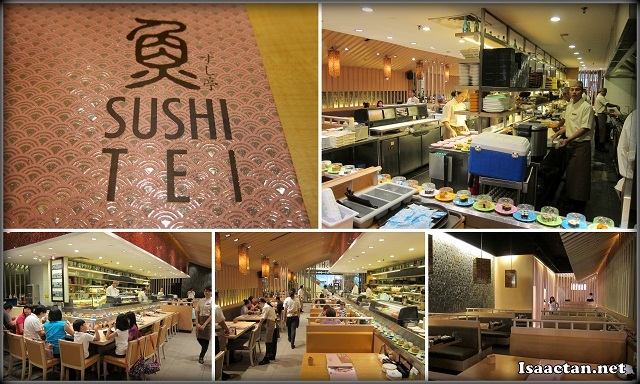 Sushi Tei brought out 2 soft shell crab dishes, the standalone Soft Shell Crabs and the Soft Shell Crab Tortilla Pizza. I was pretty intrigued with the way they managed to fuse Tortilla bread with Soft Shell Crab. I like it crispy, and these were done just to my liking. Before we proceeded to get some items from Sushi Tei's kanban belt, we were served with further good food as above. Aka Ebi Sushi, red prawn sushi had the really sweet taste to the prawn meat. The Maguro Yukke Pasta Salad was prepared specially for pasta lovers as it comes with spicy minced tuna pasta with french dressing. I was more interested in the next dish below. Give me any beef or lamb, and I will gladly accept it. The Gyu Misoyaki dish is essentially a DIY teppanyaki set with sliced beef and miso based sauce. Cooking it over the pan, the sliced beef smelt as good as it tasted. If not for the huge amount of other good food earlier, I would have gone for second helpings of these. Needless to say, it was a really good meal being stuffed to the brim with good tasty japanese food. The food actually tasted better than other competing franchise out there. The spring promotion menu definately had some really quality sushis and japanese cuisine, so do catch their promotion this whole month of May. Do take note Sushi Tei has branches all over at The Garden, Mid Valley, Gurney Plaza, Pavilion KL, Suria Sabah Shopping Mall and coming soon at Setia City Mall, Setia Alam. Actually I did try their corn croquette.. but forgot to take a nice photo of its inside.. conveniently left it out here. Sorry, too greedy. lol! i had sushi tei in the garden, it was fantastic. though, i probably can onluy splurge on this fancy jap food once in a while. But worth all the prices paid! i went to their outlet in MV once but didn't find it that nice.. but i saw many people in the Tropicana outlet, maybe it's nicer there?? my kids love sushi anytime..
oo they took over the San Fran Steak house place ya? The food look fresh and delish. If not mistaken they hv branch in Gardens, Midvalley too. Cos noted always Q with ppl.